I realize that this poem has serious problems with the meter, and the style is not really consistent all the way through, and that the poet didn't bother to put in the punctuation that would have helped a lot. At the same time, her rant is appropriate for what I have to say today. My sister-in-law forwarded an article from the Salt Lake Tribune that talks about the reaction some women have had to Sister Beck's conference talk, Mothers Who Know. I think it's important for me to put into words how I feel about this talk. It's amazing how one's point of view and attitude at the time of hearing a talk can change one's perception of it. A few years ago, I heard a talk on Mother's Day that had me in tears because it implied that I wasn't a fit wife or future mother because I couldn't keep up with work and housework at the same time, and was putting off having kids. The email I wrote at the time is here (for people who aren't part of that yahoo group, I'll post it on my other blog. You won't get to read the whole thread, but it's better than nothing). I mention this, because I want you to know that I can see clearly that some of the statements in this talk could be interpreted as condemnations of the way some people are living, and it could have been very hard to hear if one wasn't in a position to have the ideal. When I listened to Sister Beck's talk however, I felt differently. I heard her saying, "There are many of you who have chosen to forgo the honors and money that a career offers, and stay home with your kids. The world tells you that you're demeaning yourself and that housework is akin to slave labor. I want to tell you that this choice is a good one, and that your sacrifice and housework bless your family in more ways than just hygiene. Your work and dedication is a spiritual gift as important as the gift of tongues"
There are many differences in the talks, and I'm aware that currently my choices are justified rather than condemned by the speaker, which may have something to do with my reaction. I still believe that it's important for women to do the work that their family needs -- and if that means working outside the home, or "doing man's work" on the farm rather than just looking pretty, then she ought to be able to do that without feeling condemned. On the other hand, a woman ought to be allowed to make the other choice without stigma as well. As the newspaper article points out, many women in the world don't get to choose whether they get to do housework or not, and it seems to me that they ought to be able to hear from church leaders that the work they do is valued by the Lord. Another thing that may be part of the different interpretations that this talk gets is the choice of examples she used. It would be very easy to think that she was saying these were the only acceptable ways to be. It's easy to see how people heard, "If your dress (and your children's clothes) isn't cleaned and ironed to perfection, then you aren't taking the Sacrament covenants seriously -- and there should be no excuses here in the USA because even African women who live in dust and filth can manage it." If you take it as an example rather than a dictate though, then you can take it as saying, "It's important to wear your Sunday Best to church and make some sacrifice to make sure that Sunday Best is different than what you wear the rest of the week." Not all of our nice clothes need to be ironed, but that doesn't mean we're less spiritual. When I was little, I often had my hair curled for church, even though it meant extra work for Mom and discomfort for me. When I was in the Singles Ward, I had a hard time with talks from General Authorities that said girls ought to wear nylons, and not wear flip-flops to church. I was really trying to get my wardrobe up-to-date at the time, and I had bought a special pair of flip-flops to wear to church because that's what the fashionable people were wearing at the time. For me, that was special Sunday Best, and not lazy disrespect. During this last month, I've really come to see how much my own Mom's sacrifice in staying home with us was a blessing to me. I've been going to Prepared Childbirth classes, and there has been a lot of focus on breastfeeding and infant care along with the Lamaze breathing. The instructor has been consistently surprised that I know things like how many times a newborn will poop during the day (as many times as it eats), or that I know the mechanics of breastfeeding. I finally told her that I've seen how to take care of babies first hand because my mother did it, and I know about breastfeeding, not only because my younger siblings were breastfed, but that my mom took the time to teach other women how it was done, and she took me along on these visits. I don't know whether she did it on purpose to teach me or if she just didn't have anywhere else to leave me at the moment, but I feel as prepared to take care of a baby as a new mother can be. That is a HUGE blessing in my life that has been YEARS in the making, and I know that Mom gave up a lot in order to give it to me. Back in October, we were talking about teaching the ideals and allowing for exceptions. I stand by the comments I made at that time (email or blog) and I don't think I need to rehash them again here more than to say that the Lord recognizes that there are exceptions, and will be just and merciful to those whose circumstances make it impossible to reach the ideal, but at the same time, He wants us to know that the way to have the most happiness and joy in this life and the next is to strive for the ideal. We need to have our church leaders reminding us what that ideal is if we're going to strive for it. This is great Karen. Thanks! It sounds like one thing you are saying is, "the ideal is what Sister Beck outlined, but the Lord will forgive those who can't live up to the ideal for whatever reasons." But there are things she suggested in the talk that I'm uncomfortable framing as ideals. For example: that women's concerns ought to be focused on the appearance of their homes and children. That women have a greater responsibility than men to nurture children. That women who are working are still responsible for more than half the chores in the home. It doesn't seem right that men can do any job, but that women have to do the jobs which we as a society esteem least: janitor, cafeteria worker. In a marriage where roles aren't divided up in the traditional way, it takes more trouble figuring out who is going to be responsible for what. And some things do fall through the cracks. But it's unfair to simply assign that role to women with no real justification, and expect them all to embrace it. The only time I recall the issue of housework coming up in the New Testament, it was teaching that learning is more important than working in the kitchen. Yes, women should be focused on raising their families. So should men. Why even divide up the message? I don't mean in any way to demean women who choose the traditional role or the ones who are pushed into it. It is a noble work, filled with the deepest kind of service that often goes unappreciated. But it's not the only righteous choice. By divine design, fathers are to preside over their families in love and righteousness and are responsible to provide the necessities of life and protection for their families. Mothers are primarily responsible for the nurture of their children. In these sacred responsibilities, fathers and mothers are obligated to help one another as equal partners. Disability, death, or other circumstances may necessitate individual adaptation. It says, "by divine design" and I believe it. When children are very young, it makes biological sense to have the mother caring for them -- breastfeeding really doesn't work well when the mother is separated from the child. Also, if you're pregnant, any full time job becomes really hard to do. During times when the mother is not pregnant or breastfeeding, it's good for the family (for financial and mental health reasons) to have consistency. I also believe that men and women's brains are wired differently, and that women are, in general, better at nurturing children. That does not mean that fathers aren't an important part of nurturing -- there are plenty of studies out there that show that children without fathers face serious disadvantages -- but that's not their MAIN job. Why divide up the message? Why do we have callings in the church? Why assign Home Teaching and Visiting Teaching routes? We all ought to take care of each other, mourn with those that mourn, and comfort those that stand in need of comfort right? The Lord knows that in order to have things run smoothly, somebody has to be in charge. People are given areas of responsibility and specific people as their stewardships, and then they're given the resources and revelation needed to take care of them. If everybody was in charge of everything, then things would fall through the cracks, and there would be a lot of contention about whose fault it was. Having a stewardship doesn't mean that you can't delegate and share responsibility, far from it, but it does mean that somebody is in charge of making sure it all gets done. Nobody said that women who are working are responsible for doing more than half the chores at home. If someone already had to go that far from the ideal for whatever "other circumstances" might be in their life, then that family needs to sit down together and figure out who is going to be responsible for what chores, and how they can support each other in keeping the housework done. But somebody has to be the supervisor of the housework arrangements, and in the ideal, that should be the mother, because the father has other responsibilities that ideally he's the supervisor of. Why does the appearance of home and children matter? I don't know if you've spent much time in a home that wasn't well taken care of. Ours WAS. It was not tidy all the time, but it was clean. Our meals were not always gourmet, but they were nutritious and well balanced. 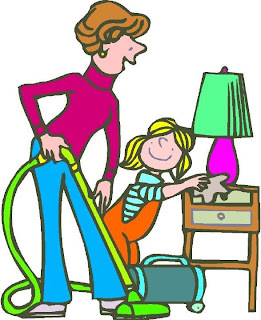 In doing my church callings and serving my friends, I've often had to go into homes that were NOT clean (Mom has too). They smell. There is human and animal waste everywhere. There are bugs crawling all over furniture and food. It's hard to tell the trash from the treasured possessions. There's nowhere to sit and be at peace. The children are not clean, not healthy, and not fed well (either malnourished or obese). You can't feel the spirit in these homes. The children generally have mental or social issues because of the chaos they live in. The parents tend to start going into debt (if they're not already there). It MATTERS. I read an email just today on the Flylady list about a mother who went to a parent-teacher conference. Her child had been struggling socially and academically for a while (the parents had been through a messy divorce), and the mother expected to hear more of the same. The teacher told her that he was improving (albeit slowly) in every aspect. She could trace a definite change to almost the exact date when the mother got on the Flylady program and started establishing routines and cleaning up the house. This kid finally felt some stability at home, and so could spare some mental energy for the things a kid ought to be able to focus on. The appearance of the house and children MATTERS. You say you don't want to demean the women who choose the traditional roles, but the words you chose to describe those roles seem to be the most demeaning ones you could find: janitor and cafeteria worker. Why not choose "Head Chef" or "Property Manager" or something that implies that there is some skill involved in doing the job well? There are forces in society that are pushing very hard to make sure that girls don't, and in many cases simply can't choose these roles. Nobody complains that the church tells men that they ought to go to work and earn a living for their family, because society values that. It takes sacrifice to learn the skills, and more sacrifice to put them into practice. Somebody in this world should be ALLOWED to say that the Lord values that sacrifice, and that it's not only OK to choose that, it's GOOD. One of the important things that she said in her talk is that Mothers Who Know Do Less. To me, that includes not only cutting down on work outside the home if possible, but also that you don't have to volunteer for every worthy cause, you don't have to have the most elegant Martha Stewart decorations and perfect gourmet food at every meal, you don't have to spend eight hours a day cleaning your house. With Flylady's system, you can keep your house clean and tidy enough in something like half an hour a day--using a timer to tell you when to quit. I think that's what Jesus meant when he was speaking to Mary and Martha. Of course they needed food, but did they need 12 courses of fancy food served to them on the best china? Sometimes other things are more important. I've always wondered how the Mary and Martha story ended. Did they go for takeout? part of forming a deep relationship. the differences between any two individuals. say variety is even more necessary. by failing to iron white shirts for your primary kids. between the spouses, and it would still be just as good. resent not being free to make the choice. The thing is, people need to decide what they really want out of life. If you want to be intellectually stimulated, praised and rewarded financially, then go ahead and find a rewarding career -- whatever career you want, and more power to you. But if you want to have healthy, happy, well adjusted children, then one of the parents needs to stay home with them. The world and Satan want women to believe that they can have both, and do everything they want, and it's a LIE. If both parents are working full time outside the home, then something is going to fall through the cracks. Even women's magazines are full of articles about how it's not humanly possible to be the perfect soccer mom with a career and children, and stories about women who discovered that, made one choice or the other, and were much happier afterwards. The women writing these stories feel just as betrayed by the lie they were fed as their mothers felt about being forced to stay in the home or accept lower wages for doing the the same work as men. If somehow individual differences mean that the mother has more earning power and less nurturing power than the father, then I think that would qualify as "other circumstances. " Sure, two reasonable people can sit down and discuss what's best for their family's circumstances, but how many people do you know who are really reasonable and actually do that? How many apartments full of reasonable single guys or girls (who were smart enough to get into college), with no one person in charge of making sure the housework gets done, end up looking like a pig-sty? When I said consistancy was necessary for mental health, I meant that the children needed it. During child bearing years, if a mom and dad switch jobs when the child is weaned but the next child isn't yet on the way, then every other year they'd have to get used to a different parenting style and a new set of rules (they may be subtle, but dad always has a different view of what's permissable on a day to day basis than mom does). Besides which, no job worth having would let you work for a year, then take a year off, then come back again at the same pay you would have had if you had stayed. In general, it simply doesn't make sense. If your family can make the numbers add up differently, then you're allowed to make an exception. I think that one of the biggest problems people have with this talk is that when she gives examples, people interpret that as saying, "this is the only good way to do things." In Elder Kopischke's talk, he tells about the method his family is using to mark their Book of Mormon dring family scripture study. Nobody took that to mean that they had to go out and buy colored pencils and a fresh BOM and start doing it his way or be condemned as a failure. If they think about it at all, they're more likely to think, "What am I doing to make my scripture study meaningful?" When she talks about the women in Africa who are making a special effort to teach their children about the importance of the sabbath day, church attendance, and reverence for covenants, we don't have to take that as meaning that we have to teach our children in the same way. The clothes in Africa have to be ironed to be presentable because when clothes are line dried, they're stiff and wrinkly. We don't have to iron most of our clothes in America because of the miracles of Permanent Press fabrics and hot air dryers. We should however, think about what we are doing to teach our children about those principles. It might mean getting everyone to bed earlier on Saturday night so that you can be to church on time in your Sunday best. It might mean that Mom will put on makeup on Sunday even though she doesn't wear any the rest of the week. It might mean something totally different. By defining homemaking as another word for nurturing, Sister Beck was not trying to say that women were bad for not doing enough of it. She was trying to give women, most of whom already bear the buden of these jobs, a new perspective. She was saying, "The work you do for your family is not just manual labor, it is an act of Christian Service, and you will be rewarded for it with specific blessings on earth and in heaven." I've learned from Flylady that it's a lot easier to clean the house when you call it a "Weekly Home Blessing" rather than "Doing Chores." She also reminds us that "Housework done incorrectly still blesses your family." I respect, and I'm grateful for the work done by Feminists and Women's Lib groups over the years. It's a great blessing to be able to vote, and own property, and have equal rghts. I'm glad that when I needed to get an education and a job to support myself, I was able to be accepted and promoted, in what is, even today, a primarily male field (Computing and IT). I think that if a woman is forced by circumstances to work outside the home, she should have as much choice in the matter as a man does. On the other hand, you cannot convince me that God didn't know what he was doing when he originally gave the jobs to Adam and Eve, and through them the rest of the human race. Men have to labor to provide food for their families, and women have to labor to bear and raise children. It's hard work, but God knows what it's going to take to make us truly happy, and I believe we should trust him. Our society makes it harder for women to stay in the home for lots of reasons -- not just financially, and through the stigma of being a "janitor and cafeteria worker" -- but also because modern inventions like cars, telephones, supermarkets, and suburbs have broken up the social networks that used to give women with children the support, companionship, and challenges they need to stay sane. The church has been trying to remedy that for years, and when the inspired programs are run like they're designed, they can do a lot to rebuild the social structure that homemakers need to be healthy. It makes it very hard to do that though, when people don't follow the council of the church leaders, and worse, actively protest against it. That's why I feel so strongly about defending this talk. I NEED the support she's offering. A lot of other women in the church (most of whom don't live in America, and don't have any choice about whether they're going to do the housework) need this message too. We need to listen to our inspired leaders, and try to figure out what God is trying to say to us through them. If we find something that's hard to swallow, then we need to study and pray to discover whether what we're hearing is what the Lord is really saying. And if, after prayer and communion with the Lord, you find that your circumstances make that talk not applicable to you, then let it go, and let it bless the people it was directed at. Please don't tell them that they're bad for believing the council their church leaders gave them during General Conference. parent needs to be with the children instead of sending them off to daycare all day. I just feel that which parent it is doesn't need to be assigned from outside the family. Making the decisions that will make your family happy and good may not be financially optimal. That's another choice that's best left to each family. Men and women have the same responsibilty for household chores. Her talk sounds very much like it is saying differently, and many men who have never touched a dish in their lives will take it as further justification for their boorish behavior.